Bike Streamers that Light Up! 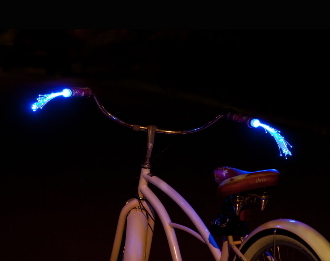 Add some sparkle to your bike with these fun glowing streamers. Fibers are about 8 inches long. End plugs into the small hole in your bike handle bar grips. Adapters included for bikes with large holes in the end. Fabulous nightime glow for your Burning Man Bike. Package includes 2 streamers, batteries included. Each side uses 3 AG13 batteries which last about 30 hours and are replaceable. Available in Pink, Blue, and Rainbow which changes from Red to Green to Blue.